The images shown are created with collected items of trash from a beach walk on November 3, 2018. 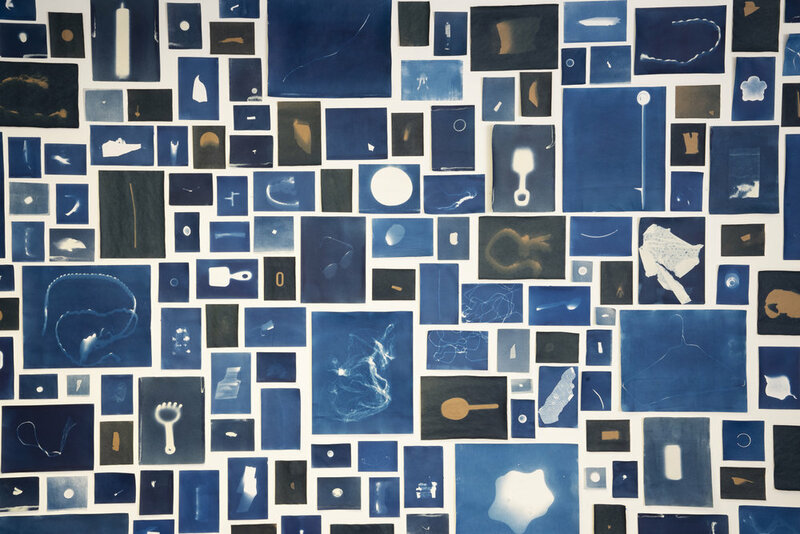 Each individual object was placed on a sheet of coated cyanotype paper, exposed, and processed. Illuminating yet haunting, the photograms appear with the outlines of the debris engulfed by various blue backgrounds. It is estimated that billions of pounds of trash find its way to the oceans each year, with a number that large it is hard to fathom how to help. This work aims to show the individuality of the problem. Each print exhibits the personal roles we play as consumers. Every one of us makes choices on what we buy and use. Someone, somewhere purchased all of these items that became washed-up beach trash and eventually was collected and repurposed by me. While the pollution in our ocean is a global issue, there are certainly steps we can all take to help form a more sustainable future. Developed by the sun in my studio for 34 days and fixed by water, this piece was made in reaction to reading about the Great Pacific Garbage Patch. The patch is located between Hawaii and California. A total of 1.8 trillion plastic pieces are estimated to be floating in the patch - a plastic count that is equivalent to 250 pieces of debris for every human in the world. I wanted to see and experience the weight of working with that specific amount of trash.